Carl and I recently spent 12 amazing days in Toulouse, France. Carl’s father lives there and we had a special family reunion to see Carl’s 80-year-old grandmother who was coming to visit from Zimbabwe. It was truly wonderful. One day we walked into a pharmacy to get something for Carl’s grandma. Thankfully Carl’s Dad has been in Toulouse for a few years and can speak French. But as I was watching the conversation, I thought: What if I feel sick in France and need help? I would like to be able to communicate at least some basic health concerns and needs. That thought inspired this lesson on health-related vocabulary. I certainly hope that you enjoy Brazil in your best health! But what if you get sick in Brazil? Or maybe you would like to tell a friend or pharmacist that you are not feeling well. It would be useful to be able to explain what you are feeling in order to get over-the-counter medicine, right? 17 useful phrases related to the most common illnesses and symptoms that may afflict travelers. After this lesson, you will be able to express your needs if you need to speak with a doctor or pharmacist. I am giving you a lot of new words and phrases here. Be sure to practice! Regular practice is the best way – maybe the only way – to make vocabulary easily available in your brain for the times when you need it. 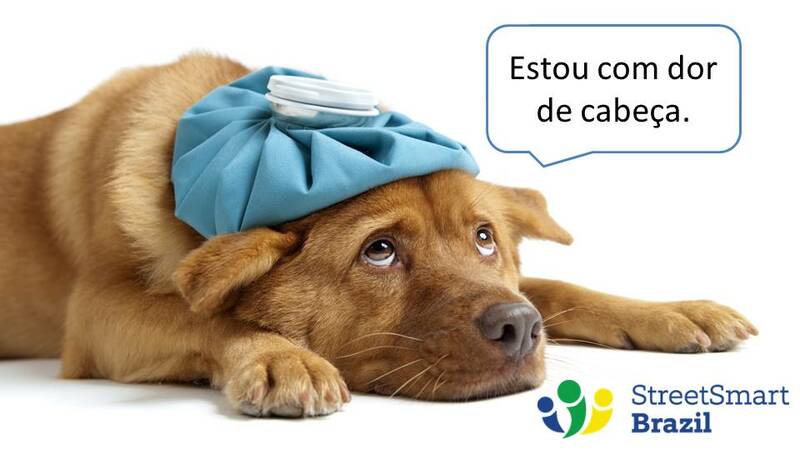 You know you can always book a lesson with Street Smart Brazil to practice and advance your Portuguese, right? This is how we represent the sound of a sneeze: Atchim! When someone sneezes, you say: Saúde! = Health! Ana: Ontem eu fui ao médico. Rui: Quem é o seu médico? Ana: I went to the doctor yesterday. Rui: Who is your doctor? Remember that we use the verb Estar to say how we are feeling. Não estou me sentindo bem. = I don’t feel well. Estou me sentindo mal. = I don’t feel well. Estou doente. = I am sick. Preciso ir ao médico. = I need to go to the doctor. Onde tem uma farmácia? = Where is the pharmacy? Estou gripado/a. = I have a cold. Estou com dor de cabeça. = I have a headache. Estou com febre. = I have a fever. Estou com dor de garganta. = I have a sore throat. Estou com dor nas costas. = I have a backache. Estou tossindo. = I am coughing. Estou espirrando. = I am sneezing. Estou com dor de estômago. = I have a stomachache. Estou com dor de barriga. = I have a bellyache. Estou nauseado/a. = I feel nauseated. Estou com diarreia. = I have diarrhea. Sou alérgico/a a camarão. = I am allergic to shrimp. I hope you don’t need to use of these words and phrases while you are in Brazil! Practice your Portuguese so you can speak with confidence and ease. Book a Trial Lesson with a Street Smart Brazil instructor to get started.